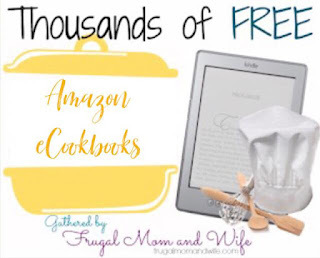 Frugal Mom and Wife: Thousands of FREE eCookbooks! So many yummy recipes that can cost a fortune on top of your grocery bill. Did you know there are thousands of FREE RECIPES at your fingertips? You can not only view on the traditional Kindle, but on your own computer, iPhone, or iPad! Simply download the Free Kindle app in iTunes to view your eCookbooks on your iPhone or iPad. To view on your computer, you can send your Books directly to Amazon Cloud Player. No Kindle required! Now that you know, here are a bunch of Free eCookbooks to take advantage of. Not only are they FREE but the link below is always updated with more Free eCookbooks! Like This? How about THOUSANDS more FREE eBooks at YOUR Fingertips, categorized by genera!